George W. Bush commutes Scooter Libby's sentence. No jail time. What luck! It happened over a weekend, while the news was all over this developing story in London about car bombs and burning airports and Mercedes and doctors from foreign countries. These events are being touted as attacks but it is hard to find any damage. Noone has been charged with anything yet in these "attacks." And the car bombs were not really bombs, they were "potentially viable explosive devices." One car was towed to a storage lot for bad parking, and only afterwards was it said to contain dangerous materials. 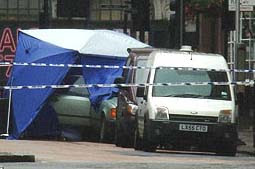 The first car sat shrouded under a blue tarp before being loaded into a van and taken to a secret laboratory. Like many anti-terror activities before today, this scare in England seems to be just that -- another boondoggle to frighten people and take their attention away from something else.